October is both Breast Cancer Awareness and Physical Therapy month. 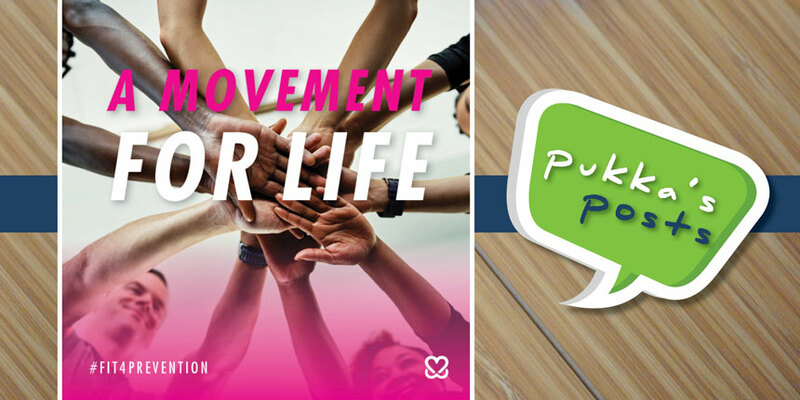 This year, Pukka Pilates & Physical Therapy was honored to participate in the Fit 4 Prevention campaign to raise awareness about breast cancer prevention through fitness and wellness by offering donation-based Pilates & yoga exercise classes. Our goal was to raise $1,000 and we exceeded it! Pukka’s amazing teachers generously donated their time and 100% of the proceeds benefitted the Keep A Breast Foundation! 30 minutes of exercise 3-4 times a week and maintaining a healthy weight lowers your risk of developing breast cancer by 30-50 percent? 2.5 hours of physical activity a week can lower your blood pressure, improve your cholesterol, and help prevent heart disease and osteoporosis? Regular vigorous exercise may reduce your risk of developing depression or an anxiety disorder? Exercise can help improve hormone levels, immune system function and reduce stress, while giving you more energy? 1 in 8 U.S. women will develop breast cancer and many of us may know someone who’s been affected. Tomorrow it will be 5 years since I received the call with my diagnosis of breast cancer. I had a mammogram today and all is good so 5 years cancer free! Tomorrow is also my mother’s birthday. Good to be spending time with my friends at Pukka and doing something good for myself. My surgeon told me that the regular exercise reduced my “manageable risk” greater than any other, even weight loss. Thanks so much for opening your studio! It has been a life saver for me! It’s been eight months since my last breast cancer treatment. Recovering from a year of surgeries, chemotherapy, and radiation is so much harder than I imagined it would be. It’s a slow and tedious process, creating this “new normal,” and one that requires an intentionality that is both exhausting and overwhelming on even the best days. But, I have learned that cancer women are cancer warriors. We fight for each new day. My body was weak and broken after cancer, and now I’m working hard to get back to the best version of me. Sharon’s studio has been instrumental in my recovery—her instructors are kind and caring, as are the clients who attend her classes. My aches and pains have slowly disappeared, and miraculously, some muscles have reappeared! Cancer is a lifelong battle, but I’m acquiring the strength to fight it well. Thank you, Pukka! The years after my diagnosis proved to be humbling. After seven surgeries, a year of chemotherapy, a year without hair, and five years of cancer meds, I could finally pronounce myself cancer free! In 2017 I joined a team of men and women committed to preventing breast cancer in Breast Cancer Prevention Partners’ Climb Against the Odds organization that works to prevent breast cancer by eliminating our exposure to toxic chemicals and radiation. Our group committed to climbing Mt. Shasta and collectively raising over $100,000. I also joined Pukka as part of my training! In April 2018 I celebrated six years of survival without the disease. For me reaching my personal summit was epic, but it was the stories, camaraderie and friendships that I experienced during the climb that will stay with me forever. Climbing Shasta was surely a physical and mental feat, but what I bring with me down the mountain and through my life everyday was the ability to carry on where others can’t, and share my story so others will not have to suffer as I did. In August 2018, Linda celebrated 5 years cancer free but her journey was a challenge! After 2 failed lumpectomies she opted for a double mastectomy followed by reconstructive surgery. Emotionally, she had to deal with seeing the scars and physically had to endure joint pain as a side effect from the medication. As part of her rehabilitation, Linda started an exercise regime that included: Pilates 3 days per week and yoga 1 day a week at Pukka, cardio 3 days per week, and daily dog walks. As a cancer survivor, Linda’s “grateful for the little things” and “appreciates each day even more.” Her mantra is “live for today and plan for tomorrow.” We couldn’t agree more! Thank you all for your bravery, participation, support and donations! Your thoughtfulness will always be remembered.